Background: Enzymatic hydrolysis of cellulose is an expensive approach due to the high cost of an enzyme involved in the process. The goal of the current study was to apply magnetic nanomaterials as a support for immobilization of enzyme, which helps in the repeated use of immobilized enzyme for hydrolysis to make the process cost-effective. In addition, it will also provide stability to enzyme and increase its catalytic activity. 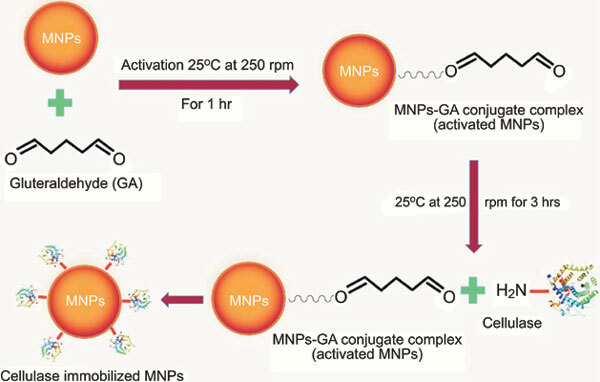 Objective: The main aim of the present study is to immobilize cellulase enzyme on Magnetic Nanoparticles (MNPs) in order to enable the enzyme to be re-used for clean sugar production from cellulose. Methods: MNPs were synthesized using chemical precipitation methods and characterized by different techniques. Further, cellulase enzyme was immobilized on MNPs and efficacy of free and immobilized cellulase for hydrolysis of cellulose was evaluated. Results: Enzymatic hydrolysis of cellulose by immobilized enzyme showed enhanced catalytic activity after 48 hours compared to free enzyme. In first cycle of hydrolysis, immobilized enzyme hydrolyzed the cellulose and produced 19.5 ± 0.15 gm/L of glucose after 48 hours. On the contrary, free enzyme produced only 13.7 ± 0.25 gm/L of glucose in 48 hours. Immobilized enzyme maintained its stability and produced 6.15 ± 0.15 and 3.03 ± 0.25 gm/L of glucose in second and third cycle, respectively after 48 hours. Conclusion: This study will be very useful for sugar production because of enzyme binding efficiency and admirable reusability of immobilized enzyme, which leads to the significant increase in production of sugar from cellulosic materials. Magnetic nanoparticles, cellulase, immobilization, hydrolysis, sugar, NTA, zeta potential.